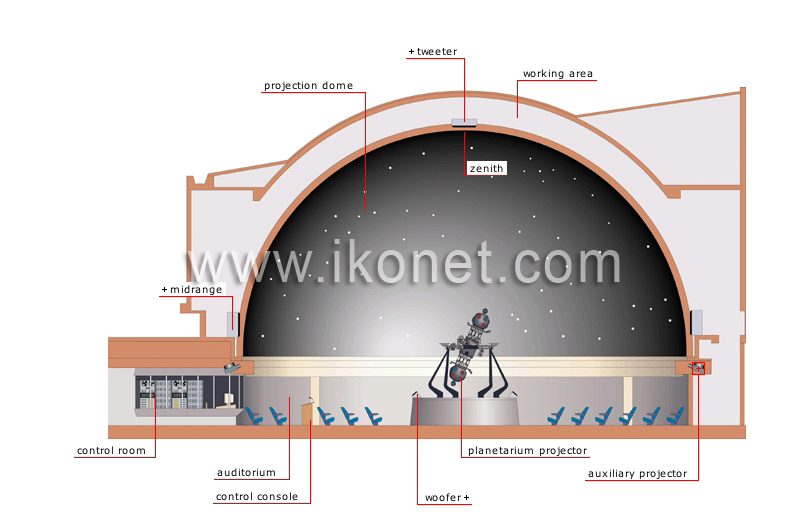 Structure where a projector is used to simulate the movement of the celestial bodies on a dome representing half of the celestial sphere. Central point of the projection dome; simulates the center of the true celestial dome for an observer on the ground. Apparatus used to produce special effects. Loudspeaker designed to reproduce the high frequencies of the sound signal. Screen representing half of the celestial dome; the aspect of the sky at different periods is projected onto the screen. Loudspeaker designed to reproduce the middle frequencies of the sound signal. The planetarium’s main room, built to receive the public during a show. Premises containing the various control and monitoring instruments required to produce a show. Instrument that serves to manually execute various commands for purposes of producing a show. Projector that reproduces and simulates the past, present and future movement of celestial bodies. Loudspeaker designed to reproduce the low frequencies of the sound signal.